This entry was posted on December 10, 2013 by Jessica Anderson. One of CIP's designer crystal awards, the Silver Blaze Award. Since we don’t manufacturer our awards directly, but assemble and engrave pieces of awards, we rely heavily on our suppliers to provide excellent products at good prices in a quick time frame for our customers. As part of our yearly recognition, we award an outstanding “Supplier of the Year” to recognize our vendors who have gone above and beyond to help our business during the past year. For 2013, we are excited to be awarding CIP Creation Corp with this honor. 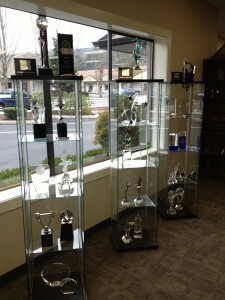 Based in Irvine, CA, CIP has been designing and manufacturing premium crystal awards since 1977. Check out their website for more information about their company. 1. Quality. They have beautiful, high quality awards with unique yet timeless designs. 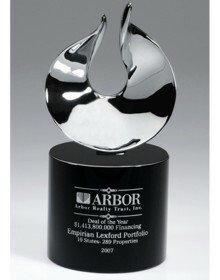 All of their awards are gorgeous, and we are proud to sell them to our customers. CIP Designer Crystal Awards on display in our showroom. 2. Service. CIP provides us with great customer service. When our Production Manager Tom places an order, their staff is polite, informative, and thorough. This year they also provided us with engraved samples of their products to feature in our showroom, so our customers can touch and feel their designer awards first hand. Located in California, we are able to receive their products within 2 days. This helps us fulfill orders for our customers quickly, so they have the crystal awards in time for their event. To see our full line of CIP Crystal Designer Awards, visit our CIP Crystal Designer Section of the Trophies2Go website. Thank you CIP for your great products and service to Trophies2Go!